Over the course of nearly forty years, Robert De Niro has established himself1 as one of the most respected and iconic2 screen actors in history. This is a position he’s achieved both through the relentless3 perfectionism of his approach to his work, and the ferocity4 with which he protects his private life. Apart from the very occasional5 tabloid snippet6, we hear nothing about the man, only ever seeing him when he’s playing someone else - which is, of course, exactly how he wants it to be. 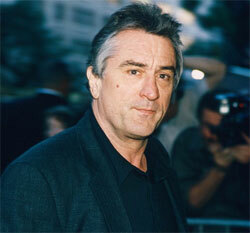 Robert De Niro was born in New York, New York on August 17th, 1943. His parents were both respected artists. His father, Robert Snr, was a painter, sculptor and poet, an abstract expressionist by style. His mother, Virginia Admiral was also a painter. Robert Jr caught the acting bug early, appearing as The Cowardly Lion in a local production of The Wizard Of Oz at the age of 10. So keen was he (even as a boy he was intensely focused) that, at 13, his mother, recognising7 his desire and ability, sent him to a progressive private school, New York’s High School Of Music And Art. But Robert wasn’t quite ready. He dropped out and spent his time roaming8 the streets of Little Italy with a no-mark street gang. Robert Jr didn’t stay off the rails9 for long, and soon threw himself back into laborious10 study. He attended the famous Stella Adler Conservatory and worked too under Lee Strasberg. By the age of 16, he was touring in a production of Chekov’s The Bear. Soon he was criss-crossing11 the South, performing Neil Simon-style comedies in dinner theatres, and would spend well over a decade honing12 his craft in theatre workshops and off-Broadway productions. In the meantime, he tried to break into the movies, promoting13 himself with his usual strict attention to detail. He’d arrive at auditions with photographs of himself in 25 different guises14. De Niro’s first important break came through his relationship with the young director Brian De Palma. De Palma cast him in The Wedding Party - filmed in 1963 but not released till 1969, the same year De Niro made an appearance on Sesame Street - then, a few years later, in Greetings and Hi Mom!.The pair would reunite15, as major players, with 1987’s Oscar-winning The Untouchables. Now De Niro’s career began to take off. 1973 was the year De Niro broke. This saw his first collaboration with the man who’d mark his career more than anyone else - director Martin Scorsese. The movie was Mean Streets and De Niro shone as a dangerously irresponsible16 shyster17 and hooligan. But, perhaps even more importantly at the time, there was Bang The Drum Slowly, a remake of a 1956 Paul Newman movie, wherein De Niro plays Bruce Pearson, a major league baseball catcher struck down by Hodgkins Disease, who tries to make it through one final season. Having returned to the South with a tape-recorder, strenuously18 researching his part, his performance was startlingly19 good, showing a wide range and genuine sensitivity, and winning him a New York Film Critics Award. Now De Niro entered his most extraordinary period of work, landing himself an exceptional20 series of roles (he’s said that “The talent is in the choices”). First he played the young Vito Corleone in Francis Ford Coppola’s The Godfather Part 2, taking the Best Supporting Actor Oscar for his efforts (he and Brando are the only actors to have both won Oscars for the same role). Then he was back with Scorsese as the unforgettable moralist Travis Bickle in Taxi Driver. He played Monroe Stahr, the big-time Hollywood producer looking for love in The Last Tycoon, and starred in Bertolucci’s sprawling21 epic 1900. There was a brief downturn as he and Scorsese attempted to recreate the old-time musical in New York, New York (De Niro learned the saxophone for the role), but he bounced back22 immediately as the morose23 and disciplined hero of Michael Cimino’s magnificent The Deer Hunter. Having been Oscar-nominated for Taxi Driver and The Deer Hunter (he’d later also be nominated for Cape Fear and Awakenings), he finally took Best Actor for his depiction of the brutish24, confused25 boxer Jake La Motta in Scorsese’s Raging Bull, a role for which he famously put on 60 pounds. De Niro ended the Nineties with Flawless and a superb performance as a super-conservative security guard who suffers a stroke and has to endure26 speech therapy with a transvestite, played by Philip Seymour Hoffman. And the new millennium brought even greater success. He made a comically ferocious27 Fearless Leader in The Adventures of Rocky And Bullwinkle. He was merciless28 (as well as an alcoholic racist) in training Cuba Gooding Jr to be the first African American navy diver in Men Of Honour. Then he was hilarious in Meet The Parents (for which he was Golden Globe-nominated), playing Jack Byrnes, formerly a psychological profiler for the CIA, who takes a mighty disliking to his daughter’s boyfriend (Ben Stiller as Gaylord Focker). Other notable roles in De Niro’s films of the 2000’s include: 15 Minutes, Showtime, Meet The Fockers, Hide And Seek, Righteous Kill. De Niro was now seriously successful as a producer, in 2008 signing a deal with CBS for his TriBeCa company to develop and produce three shows. He’d already produced such movies as About A Boy, Entropy, Witness to The Mob, Panther and Thunderheart, as well as acting as executive producer on many of the movies in which he’d starred. Beyond this, attempting to put something back into New York post-9/11 he’d organised the first annual TriBeCa film festival in 2002, then applied to build a $150 million movie studio on the site of the Brooklyn Navy Yard. He’d also become a restaurateur29, co-owning the likes of Nobu and Layla in New York, Ago in West Hollywood and Rubicon in San Francisco, the last of which he co-owned with Robin Williams and Francis Ford Coppola. His favourite though would be his TriBeCa Grill, in New York, which he frequently patronised30 and on the walls of which hung paintings by his father.